On a cold and grey day, the Maori met the Blaze on the windswept plain of James O’Breen park for their spring home opener. The game started well for Fox Valley as they quickly gained a firm advantage in both territory and possession from the opening whistle. Building on their wide structure, Fox Valley created several good attacking opportunities, but during the early going the offloads in the cold wind did not quite go to hand. Near the end of the first quarter, the continuous pressure finally broke down the Blaze defense and Luke Thomas started the scoring with a try under the posts. Once that first try was in, the flood gates opened up, and the offloads that earlier ended with opposition scrums started sticking and getting the Maoris over the gain line. The next try came only three minutes later, with a nice run down the wide channel by Doug Kluener, who made a daring out the back pass to Luke to keep the movement alive – Luke streaked down the side line, finally linking up to Cody Crawford on a nice inside line to score in the corner. 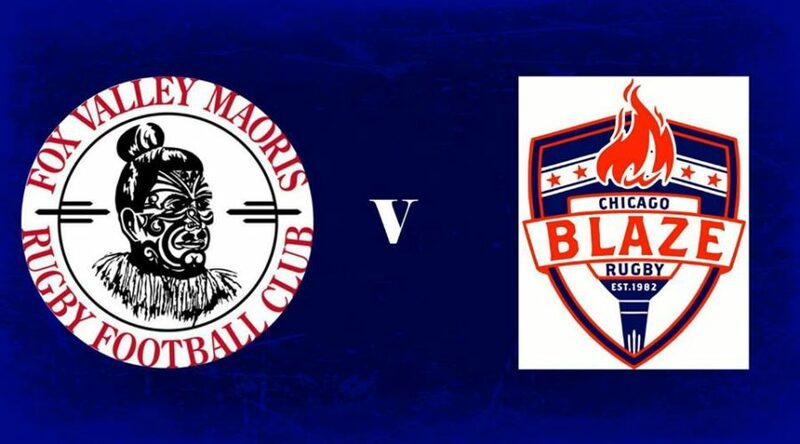 With the momentum firmly in the Maoris favor they again took the ensuing kickoff back into the Blaze half, where Chad Thomas took a crash ball hard into the line, fending off defenders left and right, found his way to the try line from the 22 meters out. A final try on a long break by Chris Caci would see the Maoris up 26-0 at half time, thanks in part to Cody Crawford’s boot – going 3 from 4 on conversions in spite of the gale force wind. In the second half the Maoris rotated in many of their new players and saw great results picking up the scoring right where the veteran’s left off. Starting with Dave Henne taking a nice line splitting the outside defense to get his first try of the year. Not long after Ryan Pokorney, denied on an earlier run, took a nice pass at the wing and dashed to the corner flag, out running the Blaze defense. Another rookie on the highlight reel was Chris Bohl, who took a wide pass on a forty meter jaunt from deep in our own half, ending with a great off load from the ground. The Blaze defense however remained stout and kept Fox Valley working hard for their gains. Despite the cold, and the 36 point deficit the tenacity of the Blaze finally yielded them some rewards, as they scored a nice try the 76th minute to get on the scoreboard and keep from being white washed. The Maoris would have the final say though, as another new Maori, Chris Mercado reached out and just barely made it over the line in the last minutes of the match to make the final score 41-7. The fans who braved the conditions were rewarded with an open attacking game, truly a great way to start off a Season full of matches at the home pitch, next up the Chicago Lawyers.